The CBE Sud Luberon is a local non-profit organisation dedicated to Extended Local Social Dialogue. Its objective is to promote employment, highlighting and supporting local initiatives. Private or public, individual or collective, it seeks to create synergies linked to economic activities, land planning and human potentials on which the South Luberon identity is based. Founded in 1982, it is recognized by prefectural agreement since the 2nd august 2004 : granted for three years, the agreement is based on specifications and an action program elaborated in consultation with the State services. Representatives of the devolved State services and Local Authorities are systematically associated to the CBE projects. The Board of Directors, composed of 21 members, is divided in 5 Colleges : elected representatives, company managers, trade unions, organizations of Social Economy, associated partners (consultative voice). The creation and organization of a CBE respond to a common will of local socio-economic actors. This expression of local democracy assure the efficiency and pertinence of the actions conducted. Average Annual Volume: 450 persons supported, more than 100 effective creations, 200 jobs created and more than 40 companies monitored. Entrepreneurs’ training through its Synergie Entreprendre program (ESF European fund). Development of social economy on its territory, through the promotion of the economic model, information of actors, support of projects and enhancement of existent entities. Synergy of the actors, through pooling and cooperation. Stimulation of Expanded Territorial Social Dialogue through the mobilisation of different colleges. The territory is being very attractive for populations and companies: sun belt effect, high environmental and patrimonial quality territory, including equivalent distances from economic attractiveness pole such as Aix-Marseille, Cadarache (CEA-ITER) and Avignon. In contact with more than 500 project holders each year, and since 2005, a basis of 600 companies on the territory with which strong relations were created. Those companies were supported before their creation by the projects managers of the CBE and are still in activity. Professional Networks: GEPE (about 120 adherent companies), UEPL (about 100 adherent companies), Association of synergies creators Entreprendre (about 25 adherent companies), Association of companies of REVOL – La Tour d’Aigues (about 10 adherent ), etc. 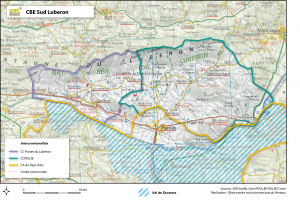 The Regional Natural Park of Luberon (PNRL), in which the CBE is an active member in the Economic Development Council, within other important economic actors of the territory. Moreover, The CBE Sud Luberon has experience in community programmes through the Synergie Entreprendre process (ESF fund), the ICS-Med project (FEDER) and the creation of the south European network for Social Economy Medcoop in which it is a founding member. It is thus recognised on the territory as a territorial development entity competent on european cooperation matters. CBE : « Décret n°2002-790 du 3 mai 2002 ».